Firms and individuals involved in the insurance industry must generally be licensed to provide the services they offer. Licensing is typically regulated at the state level, although some lines of authority are subject to federal regulation. Insurance licensing requirements vary by state and by type of insurance service being offered. Individual - Persons providing insurance related services. Agency, Brokerage, or Other Business - Firms that provide insurance services but do not hold the risk associated with the policies they work on. Insurance Company - Firms that create policies and underwrite risk. In addition to insurance agencies and adjusting companies, some non-traditional insurance outlets may also be required to hold licenses. For example, car rental companies, storage facilities, portable electronics, or travel agencies that offer insurance packages are licensed as limited lines in some states. Call center employees that take phone calls on behalf of insurance service businesses may also be required to hold individual licenses depending on the nature of their calls. Firms and individuals that provide services in multiple states are required to hold a license in each state where they provide service. Many states have reciprocal agreements that help streamline the application process, and in some cases license holders may not need to take additional examinations in the states they expand to. Individuals that sell, solicit, or negotiate insurance are required to hold an individual agent or broker license for the lines of authority they deal in. Persons acting as an insurance adjuster, serving as a managing general agent, or negotiating and settling claims are also usually required to have a license. Before applying for a license, applicants must often complete educational courses and pass an exam. After passing all required exams, applicants should submit the relevant application. In efforts to promote efficiency, many states now use third parties to guide and administer license exams and applications. States often require applicants to submit fingerprints and complete a background check during the application process. Depending on the type of service an individual provides, additional documentation or filings may be required. Licenses must be renewed annually in most cases, but some licenses have biennial or other renewal terms. Explore individual license 50-state requirements. Firms that provide insurance related services but do not have ownership of the policies themselves are also required to be licensed. Examples of these firms include insurance producers, adjusters, managing general agencies, title insurance agencies, limited lines producers, and others. State level departments of insurance oversee licensing and regulation, although many states encourage firms to go through a third party to apply for a license. 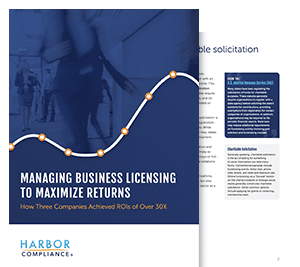 Applications vary based on the service offerings and lines of authority a business covers, and businesses that provide multiple services may need to hold more than one license. Applications commonly require name approval, proof of incorporation, a list of officers, and sometimes a surety bond. States also require businesses to designate an agent in charge on the application. The agent in charge is a licensed individual responsible for the legal compliance of the business and employees, and agents must be licensed in the same lines of authority that the firm is licensed to provide. Licenses typically need to be renewed annually or biennially. Explore agency, brokerage, and other insurance firm license 50-state requirements. Insurance companies, or insurance carriers, evaluate risk and create policies to protect the insured against harmful occurrences. Companies that undertake this role are regulated by departments of insurance at the state level, and they are required to obtain authority from the state before conducting business. The application process for a company license varies by state, however, all states accept the Uniform Certificate of Authority Application (UCAA) as a part of this process. New insurers should use the UCAA primary application, while existing insurers can use the UCAA expansion application to obtain an out of state license. In addition to the application, companies must often submit a plan of operation, detailed officer information, and must also meet capital requirements. Insurers wanting to offer their services outside of their state of formation should apply for a certificate of authority from the secretary of state prior to filing the UCAA expansion application. It should be noted that the certificate of authority that licenses insurance companies to operate in a state is a separate document from the certificate of authority issued to foreign businesses by secretary of state offices. Although surplus lines carriers are less strictly regulated than licensed carriers, many states require surplus lines carriers to register with the department of insurance. The registration process is brief, with most states requiring only financial statements and assorted documentation. Adjuster - A person or firm that is paid to adjust, investigate, and negotiate claim settlements. There are 3 categories of adjusters: company, independent, and public. Company adjusters work for insurance companies and investigate claims on behalf of the company. Independent adjusters investigate claims on a contractual basis for insurance companies. Public adjusters investigate claims on behalf of claimants, usually to determine the amount of money that can be claimed. Agent in Charge - A licensed individual responsible for the supervision of all individuals within an insurance agency. The agent in charge must be licensed in the same lines as the agency. Insurance Agent - Insurance agents act as intermediaries between the insurance company and policyholders. Agents can be either captive or independent. Captive agents represent a single insurance company, while independent agents represent multiple insurers. Insurance Broker - Individuals who sell insurance policies while representing the interests of the buyer. Brokers are typically independent intermediaries without an insurance company affiliation. Insurance Producer - May be used to refer to either individual insurance agents and brokers or insurance agencies and brokerages. Managing General Agent - An agent or broker that is involved in underwriting and has other areas of authority normally handled by insurers. MGAs are typically involved in unusual lines of coverage or in geographically prohibitive areas. Surplus Lines Insurer - An insurance carrier that takes on risks that a licensed carrier is unwilling to insure. Surplus lines insurers do not have access to state guaranty funds and are less tightly regulated by state governing bodies. Third Party Administrator - An organization that manages group insurance policies and works with the employer and insurance carrier to process claims, handle loss control, and provide risk management and consulting services. Title Agent - Title agents sell insurance that protects real estate owners against loss of ownership of a property due to a legal claim. Viatical Settlement Provider - A company that purchases life insurance policies at a discount from individuals seeking immediately available funds. Advocacy group of independent insurance brokers and agents. Professional association that advocates for favorable regulatory conditions for insurance agents and financial advisors. A standard setting and regulatory support organization that is governed by state insurance regulators. Professional association that provides education and advocacy for insurance agents throughout the United States. An affiliate of the NAIC that provides streamlined and uniform producer licensing processes.